Both the wedding and reception will be held at the Bangor Ramada Inn. The Bangor Ramada is a very classy hotel with a beautiful outdoor courtyard, giant ballroom, and full-service bar (the locally famous Barnaby's Restaurant). The ballroom can easily accommodate up to 300 people. The staff at the Ramada so far have been wonderful in helping us prepare for The Big Day (namely, we're talking about Shelley Davis, the Assistant General Manager... contact her at meetings@midmaine.com). 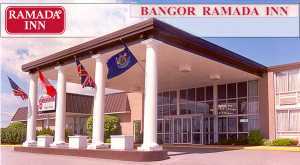 The Bangor Ramada Inn is located at 357 Odlin Road in Bangor, right off Interstate 395. Regardless of which way you're coming to Bangor, you're probably using Interstate 95. Simply take Exit 182-B off I-95, which will bring you right out at the traffic light where I-395 becomes Route 2, intersecting with the Odlin Road. The Bangor Ramada Inn is right there to your right—you can't miss it! Since the wedding and reception will both be held at the Ramada Inn, we encourage you to book rooms there if you're coming from out of town. As part of our wedding package, the Ramada allows us to reserve a block of rooms for guests at a reduced rate. See the Hotels page for more information.